On Monday, Trump administration officials announced the closure of the Palestine Liberation Organisation (PLO) Mission office in Washington in the latest move by the president to shutter or de-fund Palestinian-supporting institutions. This comes after a refusal by the PLO to participate in peace negotiations with Israel. The Trump administration also has threatened to sanction the International Criminal Court and ban access to the United States by its members if they investigate the United States or Israel; in May, the Palestinian Authority submitted a referral to the ICC calling on the body to open an investigation into “settlement expansion, land grabs, illegal exploitation of natural resources, as well as the brutal and calculated targeting of unarmed protesters, particularly in the Gaza Strip.” Last month, the U.S. announced it would cease all funding to the UN Relief and Works Agency for Palestine refugees (UNRWA), which helps some three million refugees across the Middle East. On September 9th, the administration said it was also cutting $25m in funding to Palestinian hospitals in East Jerusalem and directing the money elsewhere. Mahmoud Abbas, the president of the Palestinian National Authority, has refused to participate in peace negotiations since Trump recognized Jerusalem as the capital of Israel in December 2017. On Sunday, the United States revoked visas of the PLO ambassador and his family, which had been valid until 2020. Sports are rarely just about fun competition but a recent game led to a diplomatic crisis in the region. The Iraqi Ministry of Foreign Affairs summoned Algeria’s ambassador in Baghdad on Monday over “sectarian chants” made by Algerian fans during a football match between the two countries in Algiers. 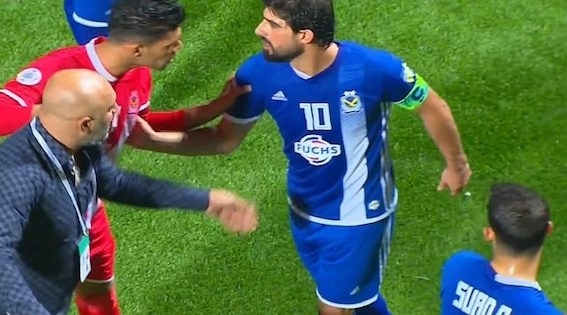 Algerian fans chanted slogans glorifying Iraq’s late president Saddam Hussein and shouted insults against Shias during the match on Sunday, which pitted the Baghdad-based al-Quwa al-Jawiya club against Algiers’ Sports Union of the Algiers Medina (USMA) team. These chants pushed al-Quwa al-Jawiya’s players to quit 72 minutes into the match and leave the field. The referee had to stop the match organized as part of the Arab Clubs Championships. Ahmed Mahjoub, Iraq’s foreign affairs spokesperson, said Baghdad had expressed “the government and the people of Iraq’s indignation… at the glorification of the horrible face of Saddam Hussein’s deadly dictatorial regime,” which was toppled in 2003 following the United States’ invasion of Iraq. YouTube has suspended the accounts of at least three media outlets run by the Syrian government, weeks after a report claimed the channels were violating U.S. sanctions and generating revenue from ads. The sanctions prohibit American companies from providing services to Syria without obtaining a licence from the Treasury Department. This comes after U.S. scrutiny over Syria’s regime using chemical weapons and other forms of violence against its own people. This is not the first time YouTube has played a role in the Syrian conflict; human rights activists and organizations have lobbied the digital media superpower to preserve content that documents human rights’ violations. In June 2017, Google introduced technology that flagged possible extremist content in an effort to fight online terrorist activity, inadvertently leading to the loss of vital information that could be used to hold perpetrators to account in the future. A new law criminalizing sexual harassment and violence against women came into effect in Morocco on Wednesday. Campaigners broadly welcomed the new law, which criminalizes “harassment, aggression, sexual exploitation or ill treatment of women” in Morocco, but activists said it does not do enough to fully protect women against forced marriage or domestic violence. They criticized loopholes that would allow girls under 18 to marry and said a failure to define forced marriage would make it difficult to implement the law. Nearly two-thirds of women in Morocco have experienced physical, psychological, sexual or economic abuse, according to a national survey. Republican senators introduced the Iranian Proxies Terrorist Sanctions Act on Thursday, which would “impose sanctions against Iran’s proxy militias and their agents and affiliates, and make clear that the United States opposes the Iranian regime’s human rights abuses, pursuit of ballistic missile programs, and terrorist activities around the world.” The bill would also require the Secretary of State to publish and maintain a list of armed groups receiving assistance from the Iranian Revolutionary Guard Corps, or IRGC; the Guards are responsible for protecting the Islamic Republic but also control up to 30% of the country’s economy. A similar bill has also been introduced to the floor in the House of Representatives.